If you’re not yet sure what mindfulness meditation is all about, let’s see if I can help clarify it for you. Being mindful is primarily about focusing your attention in a non-judgmental way on something that helps you to be more present and alert in the moment. Just by paying attention to something like your breathing, or sounds, or anything that is connected to something in the here and now, brings all the energy of your mind into the present moment. When that happens, then any thoughts or feelings that were happening sub-consciously for you that were adding to your stress or anxiety levels, can be instantly dissolved. It’s one of the simplest and most convenient ways to keep your cool during the day. It also ensures that your energy levels stay good and that your head stays cool, calm and focused. 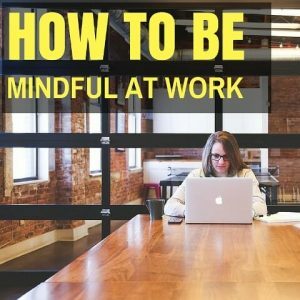 To get the most out of having mindful moments at work it’s best to set a reminder to have a mindful break every 60 to 90 minutes – even if it’s just for a minute or two. Not only does this help you to remember to stop and have a break every now and then to rest the mind and recharge your energy levels, it’s also is a way to prevent getting bogged down mentally, physically and emotionally. For me, it’s also a great pattern interrupt technique as it gets me out of any energetic rut that I may be falling into and gives me an instant fresh burst of creativity. This in turns helps with being better able to problem solve and see things from a different perspective. It’s always a great idea to start your work day mindfully. Even if it’s just 5- minutes of mindful meditation as soon as you get out bed in the morning, it helps to set the energetic tone for the day ahead. This can be as simple as doing a body scan meditation, or even a sitting meditation where you watch the breathe move in and out of your body. It can also be mindful stretching, or mindful walking, eating your breakfast mindfully, or listening to sounds that are going on around you. Once you arrive at work then you can set yourself reminders to take time-out every 60 to 90 minutes to have a few mindful moments. These moments will actually help you to be even more focused and productive because they’ll be helping your energy levels to recover faster. You can have mindful moments virtually anywhere and anytime during your work day. It doesn’t matter if your standing, sitting, walking, talking, or taking a break – anytime is a good time to be mindful at work. 2-minute body scan meditation. This is where you close your eyes and scan your body from your head to your toes and just notice any tension you may be carrying. From there you can move into a 3-minute listening meditation where you just pay attention to the sounds going on around you without judging them. You’ll be surprised at how quickly and easily this centers you and gives you a super boost of productivity inducing energy. Regardless of what mindful meditation you do at work, make sure that it’s something that you feel comfortable doing given the limitations of the space you have around you. Sometimes, it might pay you to go for a mindful walk during a break, or do some mindful eating while having lunch.